Material : Mixture of flower powder, holy powder and other sacred materials. The amulet has a strong and pleasant fragrance that lingers around even after a long period of time. 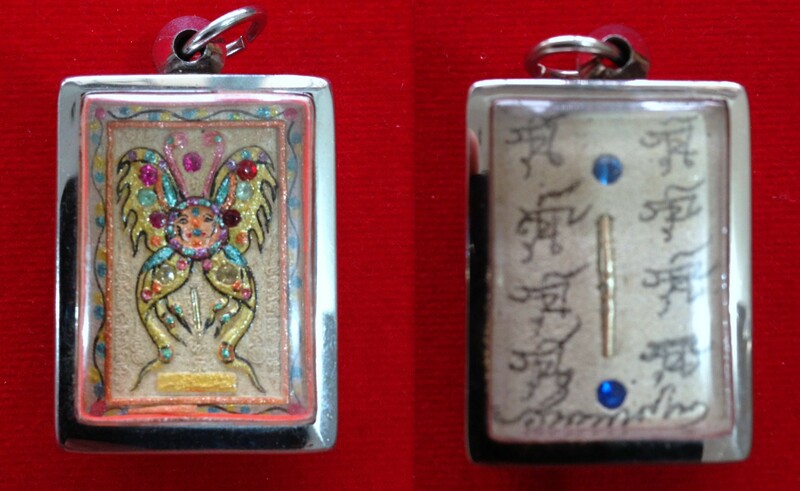 This amulet has been blessed and sign personally by Kruba Krissana Intawanno himself. Effect : Helps in creating business opportunities and drawing wealth, Dissolving disharmony and discord between people, Easier to find help from people around, Conquering and eliminating enemies, Grants wishes and helps you achieve your aims, Averting obstacles and danger. Posted in ButterflyTagged Kruba Krissana Intawanno Butterfly A Block Phim Lek BE 2543 (First Batch)Bookmark the permalink.